The big dip in Green support shown in the Colmar Brunton poll published on Thursday caused consternation amongst Greens, with the usual claims of it being a bogus poll, or an outlier. Some thought that it was proven inaccurate by the Roy Morgan poll published yesterday (Friday), but they failed to notice that while published after Colmar Brunton’s poll just about all of the RM polling was done before CB. All three polls show a significant dip in Green support in August, at the same time as Metiria Turei’s story as a beneficiary unravelled and disunity in the party became apparent. The CB poll this week is the only one to be done after the resignations of Turei as co-leader and the withdrawal from the list of two Green MPs. We can’t be sure whether it was an accurate snapshot of Green support this week, or if it is an outlier. It could be rock bottom for the Greens, as James Shaw claims, they and could bounce back by the time we get another poll. Newshub (Reid Research) may be next to publish another poll, that would be useful to get an idea of how bad things are for the Greens. Polling period 31 July-13 August. The Colmar Brunton poll was 12-16 August. Turei stepped down as Green co-leader on 9 August. Winston Peters has generally trashed polls as fake and meaningless, but it looks like when they suit his purposes he isn’t averse to leaking them. RNZ’s most recent poll-of-polls had New Zealand First sitting at 8.7 percent. But Mr Peters said the media’s polls were fake – and his own polling put his party’s support far higher – closer to 20 percent. I don’t think he produced any evidence, which isn’t unusual for him. New Zealand First leader says media polls giving him 10 percent are fake and he’s going to get 20% in the election. A Colmar Brunton poll had just been published with NZ First on 11%, up 2. Newshub has been leaked poll results from the company that does Labour’s internal polling which show it is in big trouble, two-and-a-half months out from the election. The results show Labour is on 26 percent support – crashing from 34 percent in May. Winston Peters and co are on 14 percent – up 5 percent since May – just overtaking the Greens who are on 13 percent. Peters didn’t slam this poll as fake. The company, UMR, does the polling for Labour’s inner sanctum and the results are normally kept secret from the public. Earlier in the year Little went public with a UMR poll that wasn’t as bad as usual for Labour. Andrew Little is accusing Winston Peters of leaking poll results that are damaging to the Labour Party. “Whenever you see something that’s reported as a leak, you look at who talks about it the most,” he told Newshub. This seems to have been confirmed by Duncan Garner. Late to this, but kudos to @DuncanGarnerNZ revealing Labour's poll leak was by NZFirst – because they also use pollster UMR and get results! Peters didn’t deny it, he avoided ‘reacting’. “I’ve got no reaction to that. I couldn’t give a rat’s derriere what he says,” the NZ First leader told The AM Show on Monday. He wouldn’t reveal if NZ First used UMR for its polling. Mr Peters has been talking up the poll regardless, suggesting he’ll soon have the right to call himself leader of the Opposition. It’s not unusual for politicians to trash polls and news they don’t like and then hypocritically promote what suits their purposes. But UMR is just one poll, a Roy Morgan poll also published last week had NZ First on 8%. Peters would probably call that fake. Look, you know, one thing is very important in life, and that’s this – don’t count your chickens before they hatch. However he hasn’t produced a poll that backs that up yet. National are back down to 43% in the latest Roy Morgan poll, similar to the 42% in the UMR poll covering a similar period – see Part of a UMR poll. However NZ First are on 8%, in contrast to their 14% in the UMR poll. This poll was taken after all the Todd Barclay publicity (which continues), after the Labour intern issue broke but as it emerged (so it won’t have fully impacted), and before this week’s flare up between Greens and NZ First. Of all electors surveyed 8.5% (up 2%) didn’t name a party. This was conducted by telephone – both landline and mobile telephone – with a NZ wide cross-section of 868 electors during June 26 – July 9, 2017. This leaves National and current support parties well short of a majority, on about the same level of support as Labour + Greens. NZ First are in a position of choice, but Greens and NZ First showed their incompatibility this week. Polling was done between June 26 and July 9. The Roy Morgan poll for May 2017 has just been released – this is all pre-budget. So there isn’t much change here. It isn’t much different from the Roy Morgan March poll either. National are in a danger zone and will be hoping to get a lift from the budget. Labour continue to stagnate and will be hoping to come up with a real game changer rather than failed aspirations ongoing. Greens and NZ First are looking healthy but they need larger partners to make a coalition. Labour + Greens are unchanged, as is National, but both are nowhere near a majority. Media have been making a big thing about Winston Peters after poll results come out for years. A lot of nonsense has been spouted, and there’s been very poor analysis in the rush to promote the headline maker. Peters seems to have had more proclamations of ‘king maker’ than Queen Elizabeth 2 has had curtseys. The heavy breathing would have gone up the Richter scale with two figures out this week. The first was a Roy Morgan poll putting Peters at 10.5 per cent support. A caution here. Both Labour and National will tell you they don’t put too much stock in the Morgan poll, as its numbers can move around a lot. But over time it is a useful indicator of trends. And Peters is definitely trending. Not really. 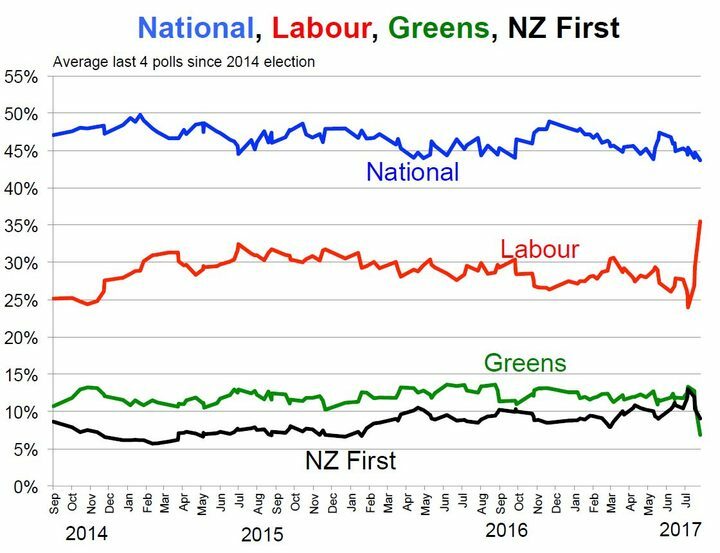 NZ First has been fluctuating up and down in polls. His numbers are particularly significant because Peters has a history of finishing strongly As the Morgan poll notes, in 2011 NZ First averaged 3.5 per cent for much of the election year before winning 6.59 per cent of the vote. In 2015 Peters averaged 5 per cent support and got 8.66 per cent on election night (the final round of polls had him at about 8 per cent). His rise appears to be starting early this year. I think that’s nonsense on two counts. The terms ending in 2011 and 2014 were quite different to this term. In those terms NZ First support dropped significantly between elections and rose significantly late in the election campaigns. This term NZ First hasn’t dropped the same, in large part due to the publicity and success of Peters’ by-election win just a few months into the term. And NZ First polled higher in Roy Morgan polls last year, eased back, and has bounced back. That is not a trend. On top of that the political situation is quite different this term, with the National led government in it’s third term, and with John Key resigning. And Labour is onto their fourth leader post-Clark, and Labour and Greens are presenting as a combined option. Since peaking at 12.5 a year ago the trend seems to be very flat with fluctuations barely outside the margin of error. The political situation this election is quite different to the last two elections. With about five months to go until the election it’s impossible to predict what NZ First support will do in the polls, and how it will end up in the election. I think NZ First is unlikely to end up with less support than in the 2014 election (8.66%, up from 6.59% in 2011), unless something unexpected happens like Peters gets sick. But it is pure speculation trying to predict how much higher they may go. Shane Jones is expected to be announced as a candidate next month – that could help their chances, or it might not. Jones’ popularity, especially outside Labour, is untested. He lost to Pita Sharples in the Tāmaki Makaurau electorate in 2011. Shane Jones’ rumoured political comeback with NZ First has faced a setback, with party members setting up a “Never Shane” group to protest his potential candidacy. Jones’ return to politics as an NZ First candidate has been tipped for some time, with suggestions he may announce his plans at his annual Waitangi barbecue on February 4. However, a Facebook page described as “a network of NZ First members and supporters opposed to Shane Jones” has been set up ahead of a potential announcement. Some NZ First MPS, deputy Ron Mark in particular, may be uneasy about Jones being promoted too. A lot may depend on how well received this year’s budget is, and how well Bill English does in the election campaign, as that will determine whether National sheds votes or not (they are currently looking shakier than previously in polls). But it’s not a given that National voters will switch to NZ First. A lot could also depend on whether Andrew Little and Labour strike a chord with voters or not. NZ First support could be anywhere between 10-15% (higher would be unusual but not impossible). But it’s far too soon to get any good idea of where they might end up. A key factor could be whether the voters are comfortable with NZ First holding the balance of power or not. They have avoided that in the last three elections. The April 2017 Roy Morgan poll has no bounce for National which eases down half a notch, but Labour still isn’t getting any traction. NZ First are back up over 10. That should be a warning to National that they need to start to look like they really want to get re-elected rather than just drifting along, and serves notice yet again that things just aren’t working for Labour. Both National and Labour-Greens would need NZ First to form a coalition based on these poll results. The Roy Morgan Government Confidence Rating has fallen 7pts to 129pts in April with 58% of NZ electors (down 3.5%) saying NZ is ‘heading in the right direction’ cf. 29% of NZ electors (up 3.5%) that say New Zealand is ‘heading in the wrong direction’. Electors were asked: “If a New Zealand Election were held today which party would receive your party vote?” This latest New Zealand Roy Morgan Poll on voting intention was conducted by telephone – both landline and mobile telephone – with a NZ wide cross-section of 862 electors between April 3-16, 2017. Of all electors surveyed 7% (down 0.5%) didn’t name a party. The March Roy Morgan poll is most notable for the slump in support for National. This has happened before, followed by a bounce back, so it will take another poll or two to find out if this is a temporary swing or becomes a trend. This should be making National a bit nervous. They dropped to 41.5% in September 2016 but bounced back to 48% the following month. Labour may be a bit happy but below 30 is still not flash for them. However a Newshub/Reid Research poll out today has more ‘normal’ results, with National on 47.1%, Labour on 30.8%, Greens on 11.2% and NZ First on 7.6%. The February Roy Morgan poll is unusually stable (for them) compared to January with just a few minor adjustments across the board. Labour + Greens are 39% compared to National’s 48%. National is polling at nearly double Labour’s level of support. Electors were asked: “If a New Zealand Election were held today which party would receive your party vote?” This latest New Zealand Roy Morgan Poll on voting intention was conducted by telephone – both landline and mobile telephone – with a NZ wide cross-section of 852 electors between January 30 – February 12, 2017. Of all electors surveyed 5.5% (down 1%) didn’t name a party. That polling period is well before the Mt Albert by-election. In addition the New Zealand Roy Morgan Government Confidence Rating is unchanged at 140pts in February with 63.5% (up 0.5%) of NZ electors saying NZ is ‘heading in the right direction’ compared to 23.5% (up 0.5%) that say NZ is ‘heading in the wrong direction’. National and Bill English should be be fairly happy with this result. Labour may think the Mt Albert by-election will make the difference but there’s little reason to think it will affect support much. ‘Poll of polls’ average out poll results but with the small number of polls in New Zealand they can fluctuate nearly as much as the two polls being done, Colmar Brunton and Roy Morgan. CB is polling every three months, RM monthly. RNZ’s latest Poll of Polls up to mid-February gave Labour an average of 28.5% through January and the first half of February, with just seven months to run until the election. This was 2 points up on its late-2016 average of 26.4%. But it is well below its 32.5% average at this time in the 2014 election year, from which it dropped to 25.1% in the election. The Greens latest average is 11.5%. That gives a combined Labour and Greens score of 40%. …and Greens appear to have hit a support ceiling. Set that against National’s latest average of 46.7%, close to where it was in November before a 2-point boost after the smooth changeover in December from John Key to Bill English – and very close to its 2014 election score. The switch to English has had a negligible effect on polls so far. The trends give an overall picture. It’s still seven months until the election in September and a lot can and no doubt will happen. Roy Morgan should be due to release their February poll which will add a bit more to the poll picture.